The National Retail Federation’s NRF Big Show conference at New York’s Javits Center is generally a sea of navy suits, corporate meetings and private equity managers looking for the next big thing. But if you looked closely, you would’ve seen a 32-year Australian fashionista in a trendy fisherman cap and thigh-high boots creating fun videos for her Insta-Stories. Hamming it up for the camera with her marketing team, she danced on conference tables, slo-mo strutted down the aisles, fake-hoarded booth swag, created an “unboxing video” of her boxed lunch, and coined the conference hashtag #confchella. It might’ve seemed like all fun and games, but don’t be fooled. The Australian Lu—who has 165K followers on Instagram as @thelazyceo and is instrumental in growing @showpo’s 1.2 million following—takes her social media very seriously. In fact, she credits her scrappy media savvy for building her women’s fashion retailer from zero to $60 million in nine years, without taking a dime of outside money (the site originally started as Show Pony and operated out of her parent’s garage). Meanwhile, at Australia’s 2018 Online Retail Industry Awards, Showpo won Online Retailer of the Year, Best International Conqueror, Best Site Optimization and Design, and Best Social Commerce Initiative. 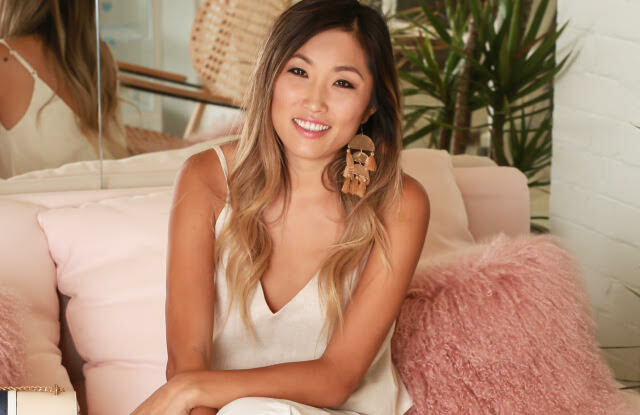 Lu sat down with the Accessories Council to share the secrets of her success, offer social strategies that other companies can emulate, and explain her plans to take on the US. Takeaway number one? She might be TheLazyCEO on Instagram, but she is anything but. You used Facebook to viral success in 2011 when businesses weren’t taking it seriously. Why? Showpo was all self funded, and I did this almost by default because I couldn’t afford traditional marketing. We were getting some traction with Facebook ads, but six months into it, I had the idea to do a modeling contest. We had 3,000 followers on Facebook and soon people were creating Facebook pages and events to get votes for the contest. Then they got their friends to enter themselves into the competition. We went from 3,000 followers to 20,000 in the space of a month. And it cost us nothing. That’s when I really started to understand what going viral meant. Traditional brands or companies at that time either didn’t believe in social media, thought it was a fad, or just didn’t know how to do it. But that’s when I started to take it all seriously and look for more hacks. Once you figure out how the algorithm works, it’s just taking advantage. Funny enough, in a 2016 interview, I casually said that ‘Facebook was dead,’ and it became this huge article headline. But what I meant was, there’s so much you can do with Facebook but you have to balance a paid strategy with an organic one. Meaning content, right? How often do you post a day and what do you post? We make it all about content. We think about how we can add value to our customers and our audience, even when the content isn’t directly selling items from the site. Having a strong original content video strategy on Facebook is key. We put up 13 posts a day, including funny memes, funny videos, product… cat videos. We try to put out 2 to 3 curated videos a week, which feature shoppable Showpo items (might be a girl dancing in an outfit, the latest trend of the summer, how to wear something). So two years after they were saying that Facebook is dead, Showpo posted a Things That People Do That Annoy You video on Facebook and it got 7.3 million views! It had nothing to do with our product or site, but was all about branding and building trust. People trust familiar faces, which is why they trust influencers. I try to be in as many videos as possible, and I was in that one. And our models are unique and exclusive to us. Each video we do gets cut 13 ways. We need content for Instagram, Insta Stories, YouTube, Snapchat, Facebook content, Facebook ads, etc. So two years after saying that Facebook was dead, we were the most engaged brand in Australia on Facebook in 2018. A lot of e-tailers have a blog tab, but Showpo’s Blog page looks like a full-on magazine: with Boy Stuff, Career Stuff, Life Stuff and Celeb Stuff. Shop is at the very end. What percentage of the content isn’t even related to the brand’s product? Probably 50%. We put a lot of original content on the website that is just useful to our followers [i.e., Email Etiquette, or How to Negotiate a Work From Home Sitch]. We did Beauty Hacks before we even sold beauty on the site because that’s what our customers wanted. Then we put the articles on Facebook and Insta Stories too. It’s a way of bringing people to the website. So maybe this why magazines are going under? Consumers are getting their information from their favorite retail or brand sites? In a brand survey we were surprised to discover that compared to our competitors, consumers thought of Showpo as a friend. That was really touching. And friends admit when they make mistakes, right? Does that explain your deskside YouTube video apologizing to customers about some major Showpo glitches? You mean the f*ck up video? (laughs). They’re studying it in business school! We just wanted to be transparent and honest with our customers about some problems we were having [the video was literally called So… We F*cked Up!]. It was very pure. We could not believe the impact it had. I’m very involved in the startup community in Australia, and I wanted people to know that it’s ok to mess up. And what you do in those moments will shape who you are as a businessperson and a business. So, if there’s a problem, admit it, own it… then get on with it. Do consumers generate content for you as well? When you order something, the site invites you to do a post and share how it looks on you. It’s Show us your Showpo! It’s about building a community, not just selling clothes. Two years ago, we doubled our size offerings on the website for items we make ourselves, so anything we designed ourselves that was size 0-8 is now 0-16. Potential customers had expressed frustration that curvy or plus-size was frumpy or limited in choice. Now when we show an item on the site or mobile, if it goes up to larger sizes, we show it on two models, including a curvy one. It takes up extra screen space to show the same item on two models, but something we feel strongly about. Today, 30% of Showpo’s sales are done in the US. How are you ramping that up? Well even though 30% of our sales are done in the States [Showpo has a distribution center in California], 50% of our social media followers are from there. When we do a store in the States, it will be pop up marketing play with influencer partners. Styles and attitudes are pretty similar, but our website has geo-tagging, so if you logged on from the States, the money would convert to US dollars and captions would say rompers instead of playsuits. And of course the weather in North America has a whole colder season that doesn’t exist for us so we can’t get everything we need from Australian designers. So we’ve been buying more from US wholesalers and added a local design team to design for the northern hemisphere. Jewelry is our number one accessories category and shoes have really grown. Accessories do really well for us in Australia since we can’t layer our clothing as much, so we layer our accessories! What about brands or capsule collections? We’ve also done an exclusive lipstick range collaboration with Australian influencer Lily May Mac (3.8 million followers) and are looking into more capsule collections. We take our influencers to Coachella and even though we don’t set up a physical presence, we get press and really good content for our social media and web pages. We have our own Coachella range, which keeps growing every year. We used to call it the US Festival range, but let’s be honest, it’s the Coachella range!